The term “average days on market” is a calculation of the amount of time between when a home has been listed for sale in the Realtor database (“MLS”) until it goes under contract for sale. As you can see, the average days on market for homes in the Bay Area is the lowest in the country, making it a great time to sell a home. 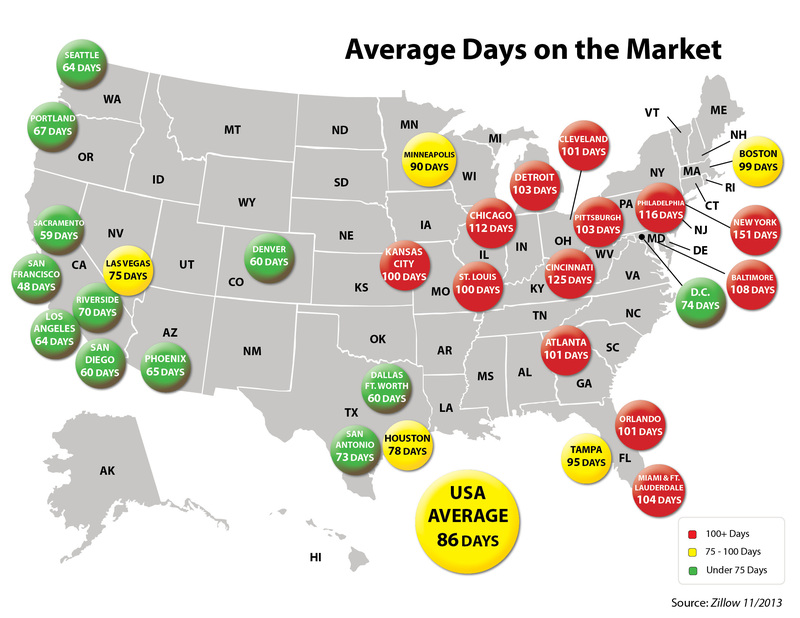 The low inventory in our area is a huge factor in the low number for average days on market. Contrary to popular belief, the winter time is actually a good time to sell because of the low inventory and because buyers looking at properties during this time tend to be more serious about making a purchase. These buyers often have excellent reasons for purchasing (job relocation, to be closer to family, etc.) and are willing to make offers that sellers are more likely to accept for negotiation. As a buyer, being ready to hit the ground running once you decide to purchase a home is imperative. Having your letter of pre-approval from your bank and knowing the funds you have available for the purchase can make the difference between getting into contract on that dream home you saw over the weekend and losing it because you were not prepared to move quickly.